A SIX-year-old boy was found with the same levels of methamphetamine in his system as an adult drug abuser after his family unwittingly bought a house that had been used as an ice drug lab. The shocking case has led to warnings for prospective homeowners and tenants to check with authorities if their home has been previously contaminated by drugs. The Victorian family bought the $500,000 rural property after completing pre-purchase property checks and are now seeking compensation from the council who they allege did not reveal the previous owners had been ordered to clean up after police found drug making equipment. Public health scientist and Flinders University researcher Jackie Wright said tests, done a year after the family moved in, showed the apparently “nice, normal” house had methamphetamine readings up to 40 times the acceptable level. “The two youngest kids had hair sample methamphetamine levels the same as what you get from low-level adult drug users,” Ms Wright said. The family, who asked not to be named, had done pre-purchase property checks but the council did not reveal it had told the previous owner to clean up. The youngest boy’s school work slipped, he had sleep and respiratory problems all associated with ice contamination. After tests on the home, the family moved out, abandoned all their possessions and might have to demolish the house. Ms Wright said the case highlighted a nationwide problem. 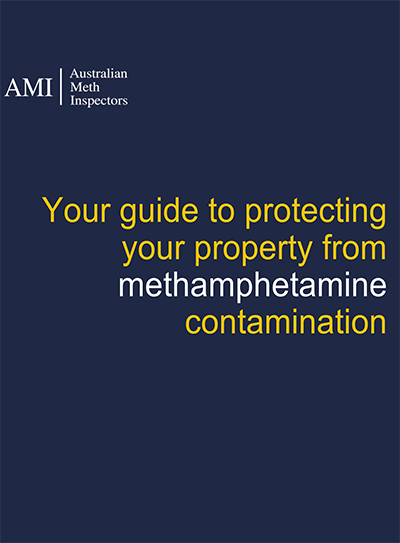 Making or smoking methamphetamine left behind residues that seep into gyprock, carpets, curtains, furnishing, chipboard and house contents. Decontamination could require ripping out carpet, curtains, plaster boards, ceiling, electrical wiring, air conditioners, heating, insulation and all the contents. A file image of a clandestine drug lab in Australia. Drug labs need thorough cleaning after operators are prosecuted. File image. “Cleaning up these homes can run from thousands to tens of thousands, but could be as high as the cost of demolition and rebuilding,” Ms Wright said. Newcastle University Professor Megharaj Mallavarapu of the Global Centre for Environmental Remediation said methamphetamine making left persistent residues. “The byproducts produced can cause serious threats to the people living in those buildings,” he said, adding that the number of affected Australian homes would run into the thousands. Ms Wright said symptoms included disrupted sleep, vivid dreams, anxiety, respiratory problems, an asthma-like wheeze, rashes, children with inattention or ADHD-like behaviour, with young children worse off because they put toys and fingers in their mouths. In response to Sunday Herald Sun inquiries, the Victorian Government last week reminded councils to follow public health guidelines properly. That included ensuring the owner cleaned it and met all guidelines. Last year police discovered 167 laboratories in Victoria and each year find about 700 nationwide — but the undiscovered number could be 10 times that, according to Ms Wright. Checking a home for methamphetamine contamination. For the past five years meth lab clean-up specialist Julie Butchart has been donning special protective gear to venture into houses, mark out 10cm by 10cm squares on surfaces, then swab for traces of the drug. She reports to homeowners and councils on what needs to be done to decontaminate the home. “It quickly becomes very expensive, very fast,” Ms Butchart said, owner of Forensic Occupational Hygiene Services in Melbourne. Government guidelines put the acceptable amount of methamphetamine swabbed from a 100 sq cm square at 0.5 micrograms, but Ms Butchart found homes 50 times as contaminated. “At that level you have to strip building materials out. Rip up the carpet. Usually you are removing plaster board, the ceiling and electrical wiring as well because the particles are attracted to electrostatic items. “The air conditioner typically will get pulled out, and the heating and ceiling insulation. “It can even penetrate the timber frames. All contents of a house may need throwing out,” she said. But lower contamination levels could effectively be cleaned with chemicals. Ms Butchart said stripping a home cost tens of thousands of dollars and Ms Butchart said once the rebuild costs were added on, it was sometimes cheaper to demolish. Many people would be surprised by the types of houses and the suburbs she was called to. She said would-be homeowners or tenants could talk to neighbours to find out the history of the house. — There may be no visible trace of dangerous chemicals that have seeped into walls, carpets, curtains and furnishings. — Decontamination can cost tens of thousands and require getting rid of the carpet, curtains, plaster boards, ceiling, electrical wiring, air conditioners, heating, insulation and all the contents. Sometimes it is cheaper to rebuild. — Health symptoms can include disrupted sleep with very vivid dreams, anxiety, respiratory problems, an asthma-like wheeze, rashes, behavioural changes in children such as inattention or ADHD-like behaviour and increased susceptibility to illness, but more research is needed. — Young children are worst affected because of frequent hand to mouth contact after rolling around on contaminated carpets and running their hands along walls and because they pick things up that have been sitting on contaminated surfaces and put them in their mouths. — Contamination occurs through cooking and/or smoking the drug. — Tell-tale signs can include burns, unusual stains or smells, yellowed walls, and rust in strange places such as on window fittings or door handles. — In 2013 Victoria Police busted 142 clan labs. In 2014 it found 154, and in 2015 it uncovered 167. It is believed police only bust a tenth of all drug labs. — Guidelines state that once a “clan lab” is found police should notify the council who inform the owner. The council is supposed to check that the house is properly decontaminated.